Millions of individuals in the U.S. each year suffer from depression, making it one of the most prevalent mental health concerns. It’s likely that you know and love someone who is affected by it. Maybe you have experienced firsthand some of the symptoms, when handling daily activities becomes a struggle, affecting every aspect of your life. Depression robs individuals of joy and fulfillment. Insight Counseling Centers helps clients recognize and utilize effective tools to work through depression. Brooke Lamb, MMFT, counselor at Insight, explains her counseling experience with depression and the journey she takes with clients facing this issue. Q: How would you define depression? Brooke: Depression can mean a lot of different things to different people. However, clinically, we’re trained to diagnose mental disorders by the DSM-V (the diagnosing manual for psychiatric disorders). Generally, when the layperson thinks of depression, they would think of chronic low mood, fatigue, lack of motivation, and potentially suicidal ideation. Q: What are the symptoms of Major Depressive Disorder (MDD)? Brooke: In adults, MDD can present in various ways, but most commonly includes chronic feelings of sadness, lack of interest in activities previously enjoyed, and suicidal or self-harming ideation or action. Q: As a counselor how do you approach counseling a person dealing with depression? Brooke: The first step is to join with the client. Many people have preconceived ideas or stereotypes about depression in their minds and may have shame or embarrassment about receiving a depression diagnosis. It is crucial to build an empathetic, positive connection with the client before giving them this diagnosis. As far as treatment goes, there are many different approaches to treating depression in psychotherapy. One of the most common is Cognitive Behavioral Therapy (CBT). This is a theory used to help clients redirect their thought patterns and change their beliefs to more positive, helpful, and true ideas rather than the ones keeping them stuck in a depression cycle. Q: How can you explain to an individual the difference between depressed and clinical depression? Brooke: Clinical depression implies that the person fits the criteria for Major Depressive Disorder. The word, “depressed,” can be used to indicate general low mood or malaise that may be very challenging, but not necessarily strong enough to merit a full MDD diagnosis. Q: What’s been the hardest aspect of counseling a person with depression? Brooke: The most challenging part of counseling a person with depression is the fact that several of the most helpful treatments for depression (exercise, healthy eating, journaling, and seeking medical care) require a significant amount of motivation, and persons with depression tend to have a lack of motivation. This lack of motivation is often due to a chemical imbalance in the brain (low serotonin and low norepinephrine) that needs to be addressed by medication and psychotherapy. If a person is not motivated to take care of themselves, the depression can stay and worsen because the tools for feeling better are not being utilized. Q: How often do people struggle with telling family and friends that they have depression? Brooke: Culturally, having any kind of mental health issue carries some stigma in our society. This is slowly changing over time but is still an issue for many people, particularly people in certain subcultures (nationality, religion, etc.). These people may feel that there is something wrong with them for having a mental health issue rather than believing it is the same as any other medical problem that isn’t anyone’s fault. These people may fear rejection or lack of understanding from family or friends. Fortunately, this is changing in many communities, and awareness around mental health is growing. Q: Does that struggle stem from the negative outlook on depression? Brooke: Definitely. Before research could prove that depression is a chemical imbalance in the brain, many people believed depression was the result of laziness, lack of care, or selfishness. This is changing in America but there is still much improvement to be made. Q: What do you want people to know about depression? Brooke: I want people to know that having depression doesn’t mean anything bad about you and that it is absolutely treatable. It’s not your fault, and the best thing to do is seek help and share your experience with safe people. 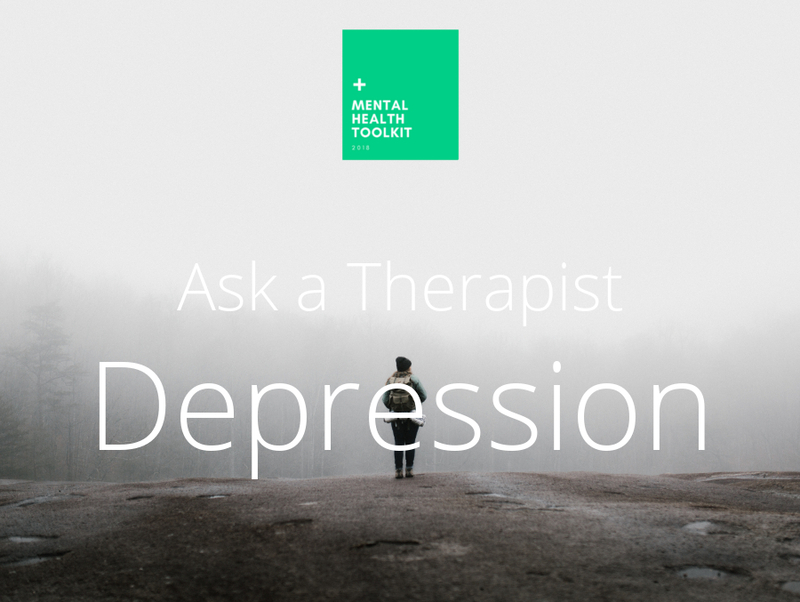 Q: How do you handle the hardship of counseling someone with depression? Brooke: At times counseling people with depression can be heavy. It is sad to witness a person struggling with their desire to live or with knowing they are worthy of love. It’s important to seek supervision/consultation with other counselors who have experience with this to share any feelings that may be coming up for you as a therapist. Mostly I view helping people with depression as a privilege and an honor. Someone letting me in on their deepest pain is sacred, and I am grateful to get to walk alongside people in their journey to healing. previous post: How is your year going so far?